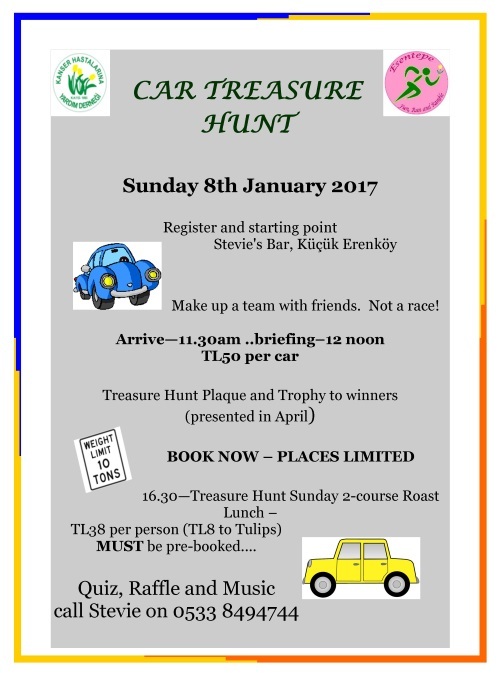 By Sue Steel – EFRAR 2017 Committee …..
Sunday, 8th January will see the fourth consecutive Car Treasure Hunt held as one of the major events leading up to the Sunday, April 9th Esentepe Fun, Run and Ramble 2017. The event will be run by Brian Hills and hosted by Stevie’s restaurant at Küçük Erenköy which will also be the registration and starting point. Participants are requested to arrive at Stevie’s around 11.30am to register by 12noon. The treasure hunt will start at 12.30. Entries will be 50TL per car, all which will be donated to EFRAR. Maximum 4 persons per vehicle for health and safety reasons. The winning team will receive a Treasure Hunt plaque and trophy. The trophy will be presented in April at the Esentepe Fun, Run and Ramble Entertainment and Auction evening (date to be confirmed). This event is not a race but is designed to be fun, with some skilful driving, map reading and clue solving. Around 4.30pm, Stevie will be offering a “Treasure Hunt” two-course Sunday roast for just 38TL per person (8TL to Tulips) which MUST be pre-booked. Call Stevie on 0533 8494744 to book your place on the Treasure Hunt and to book your lunch. In addition there will be a quiz, raffle and music, taking guests well into the evening. For a small donation, guests will be able to sponsor a friend to sing – or not to sing! This event promises to be a fun, challenging way to spend a winter Sunday so come along and support EFRAR and Tulips. 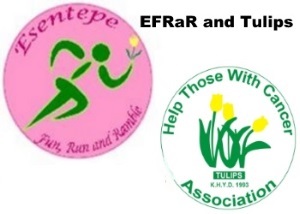 This entry was posted in Entertainment, Events and tagged EFRAR 2017, EFRAR Car Treasure Hunt 2017, Help Those with Cancer Association (Tulips), North Cyprus, Stevie's Restaurant Küçük Erenköy, TRNC. Bookmark the permalink.